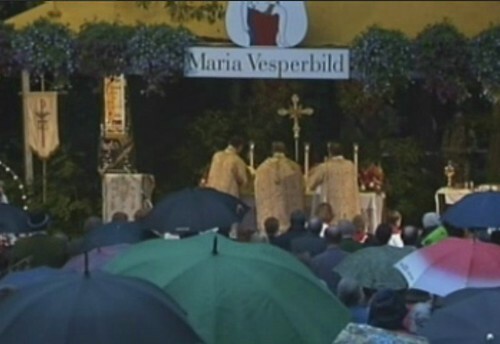 On the evening of this Feast of the Assumption of the Blessed Virgin, the main Mass at the pilgrimage site of Maria Vesperbild in Bavaria has been celebrated by H.E. 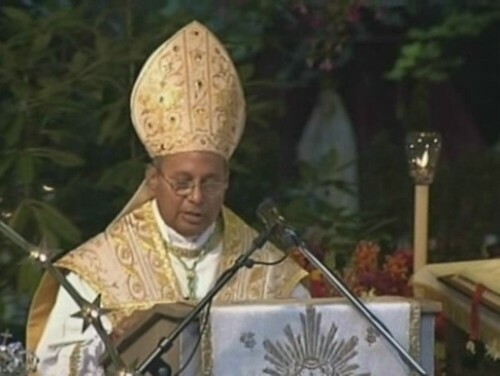 Archbishop Malcom Ranjith, Secretary of the Congregation for Divine Worship. 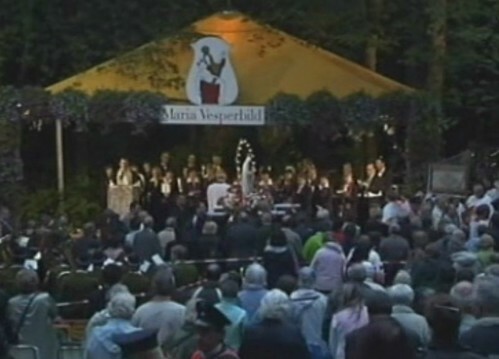 While the bad weather was not propitious, there was still a large number of faithful, including the Princess of Thurn and Taxis and the Bavarian ministers for Justice and Agriculture. This reform of the reform site has been mentioned last year on the NLM, cf. this and this post. 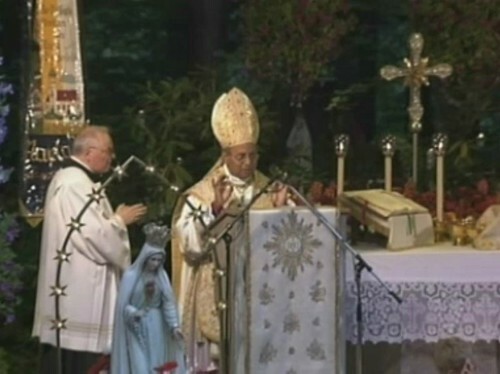 As is customary at Maria Vesperbild (Vesperbild, by the way, literally "Vespers image", is the German term for the pietà), this wonderful Mass was celebrated ad orientem. 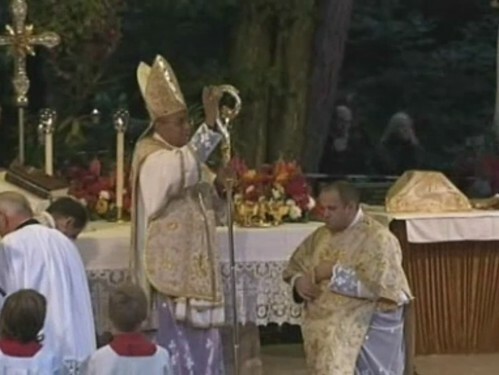 The Archbishop was vested, beneath the chasuble, in both dalmatic and tunicle. 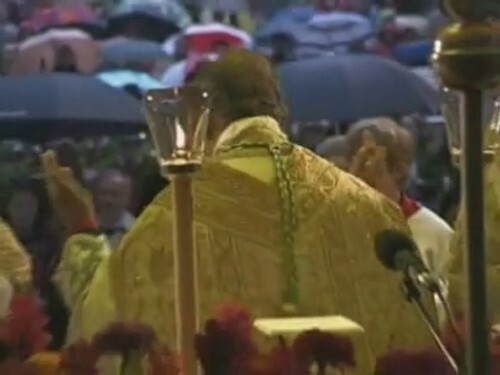 Other notable elements included that reading and intercessions were read by a cleric. 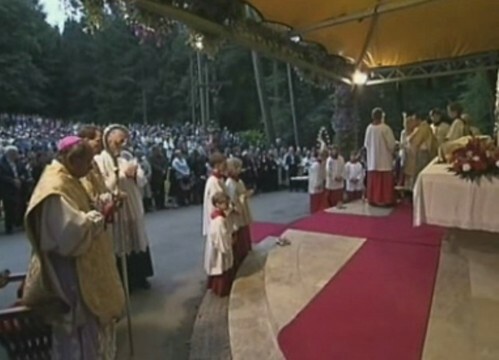 Dear brothers and sisters, today many disciples of Jesus in all estates and vocations of the Church are lacking in the reverence and joy which come from the true, continuous presence of Jesus among us, especially in the Most Blessed Sacrament of the Altar. Therefore today we must pray more than ever to the Blessed Mother of God and ask her that she may open to us the treasures of her Immaculate Heart: her faith and her love for Jesus in his Eucharistic mission. 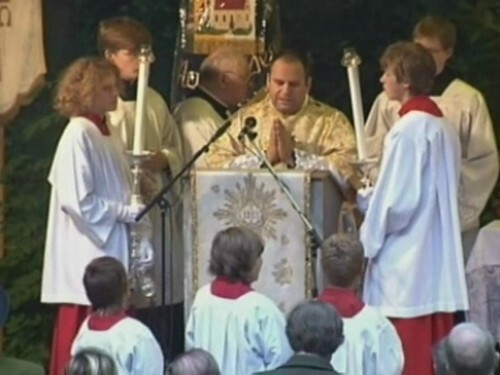 Not infrequently we hear today of priests who, out of a lack of true faith and understanding, celebrate the Sacred Mysteries of the Eucharist in a manner which is unworthy of their heavenly augustness. 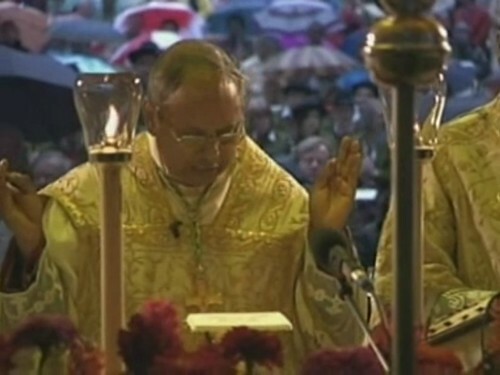 Also many faithful have lost the sense for the sacredness of the Sacrifice of the Mass. The invitation of Jesus to become completely one with Him and to draw life from Him, life which flows from His tremendous sacrifice of Golgotha, and to be a part of His heavenly assembly of the new people of God, - as the Lord says: As the living Father hath sent me, and I live by the Father; so he that eateth me, the same also shall live by me. 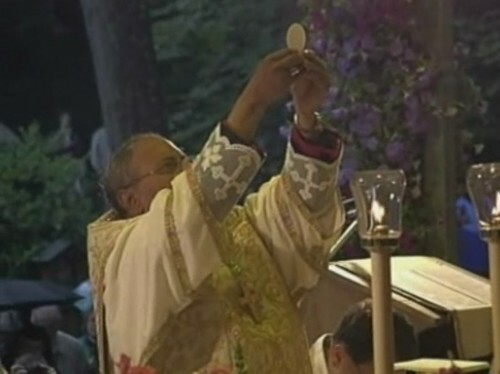 - this marvelous invitation is being degraded by a purely intramundane and horizontal view of the Holy Eucharist, in which only the earthly bread is seen any longer. 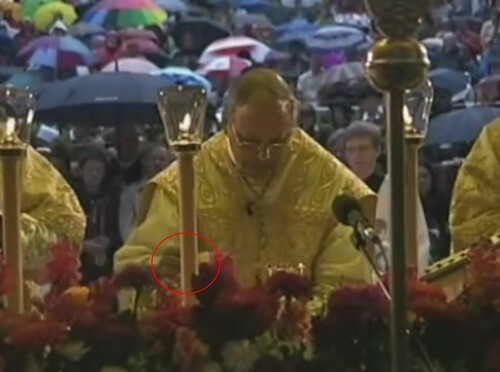 We cannot honour Mary, if we cannot honour the Eucharistic Jesus! 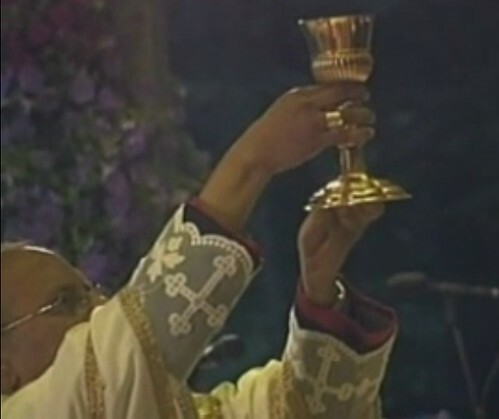 We must pray for a true renewal of the Church, as the Holy Father wants it, above all in and through Holy Mass and the veneration of the Holy Eucharist, through a deepened Faith, a worthy celebration and a courageous witness. Today more than in other times we need to love and know Mary so that we better love and better know Jesus, and better honour Him. 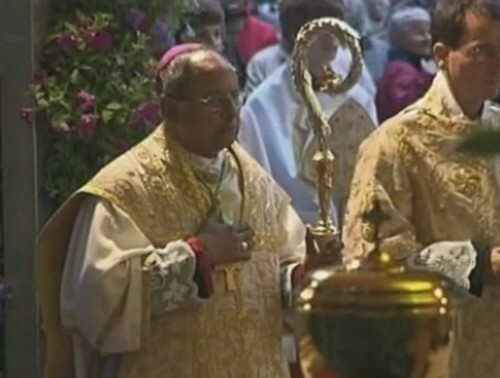 We will see how the Archbishop practically counters the lack of faith and understanding of the Eucharistic Presence of the Saviour as the Mass continues. 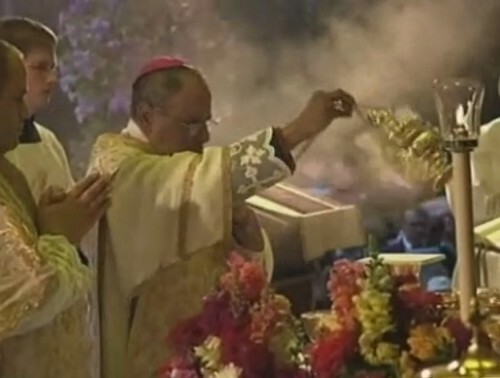 Most interestingly, Msgr Ranjith genuflected both directly after the transsubstantiation of both Species, and after their elevation, as is always done in the older form of the Roman rite, which is certainly a manner of underlining and reverencing the Real Presence. 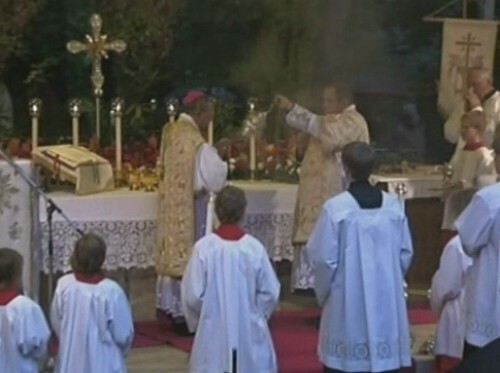 Now, before people start accusing the Secretary of the Congregation for Divine Worship of liturgical abuses because this is not mentioned in the OF books, I recommend - again - Fr Tim Finigan's excellent post Is your alb back to front? to keep things in perspective. 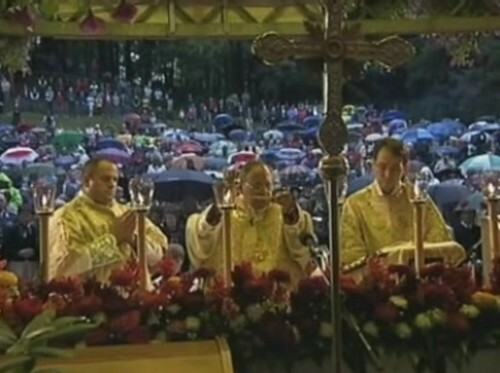 Also, it was announced that due to the nature of the open air venue and the rain, not everyone would be able to receive Communion; however, there would be ample opportunity to receive Holy Communion later in the church. 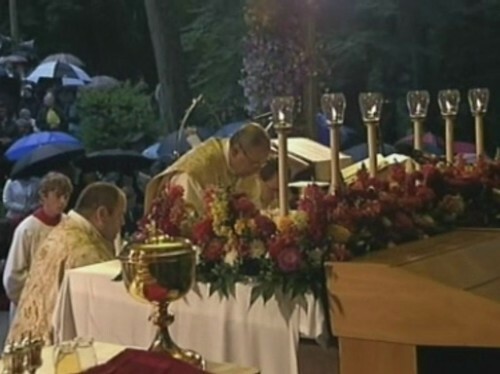 Furthermore, during Communion, a cleric prayed aloud the "Adoro te devote" in German, which was a great way of focusing the faithful on Our Lord in the Blessed Sacrament. 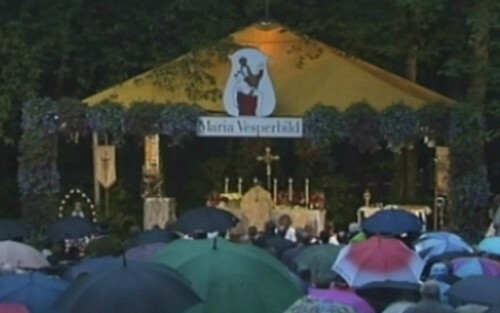 After Mass, the image of the Blessed Virgin leaves for the candlelight procession to the pilgrimage church.